I’m like a bower bird when it comes to recipes and food ideas – I collect them anywhere and everywhere I go! And some of my favourites have come from colleagues at work. About 15 years ago, I worked in an area where quite a few colleagues were keen bakers (in fact I have a couple of fabulous chocolate cake recipes from that era I need to post too!). One day, I think it was in the lead up to Christmas, a colleague brought in a small tin of round biscuits covered heavily in icing sugar. I was initially not keen to try them as anything similar I’d tried before, like Greek Kourabiedes, had been dry and crumbly, and pretty uninteresting. 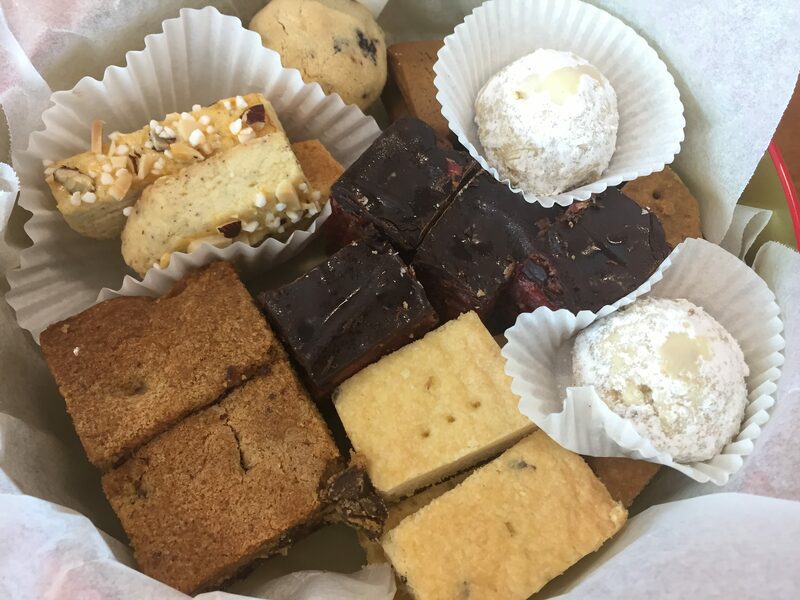 So I politely took one, and took a bite, and my mouth exploded – the biscuit literally, as it was incredibly fragile and crumbly, and also in overwhelming flavours of toasted nuts and butter and icing sugar…I’d never tasted anything like it! Preheat oven to 150C. Cream butter, sugar and vanilla. Blitz pecans in a processor until fine rubble, and add to the creamed butter along with the flour. Mix until thoroughly combined. 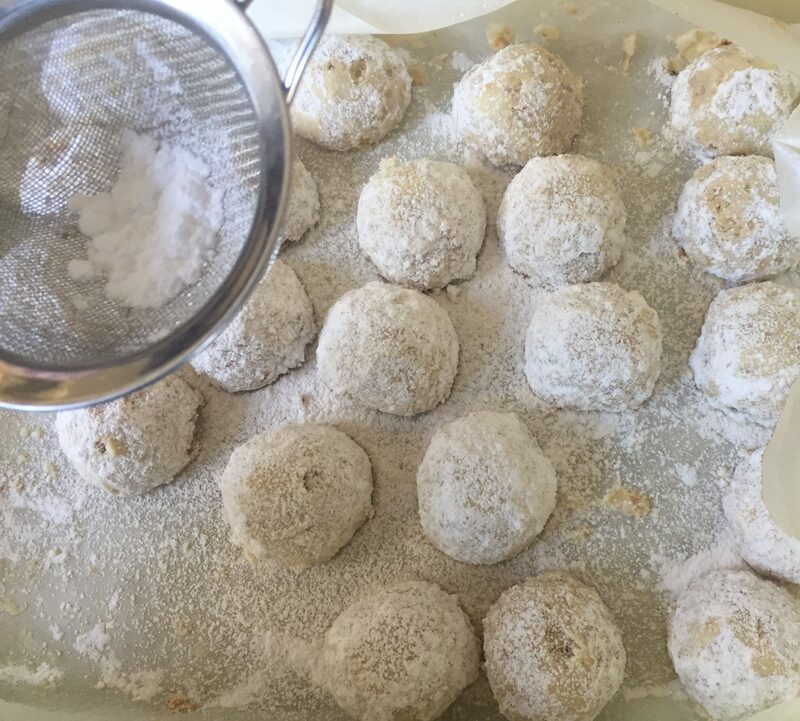 Roll or scoop small balls (I use a 1” dough scoop) onto a baking paper lined tray. Bake for about 20-25 minutes until firm and just colouring. 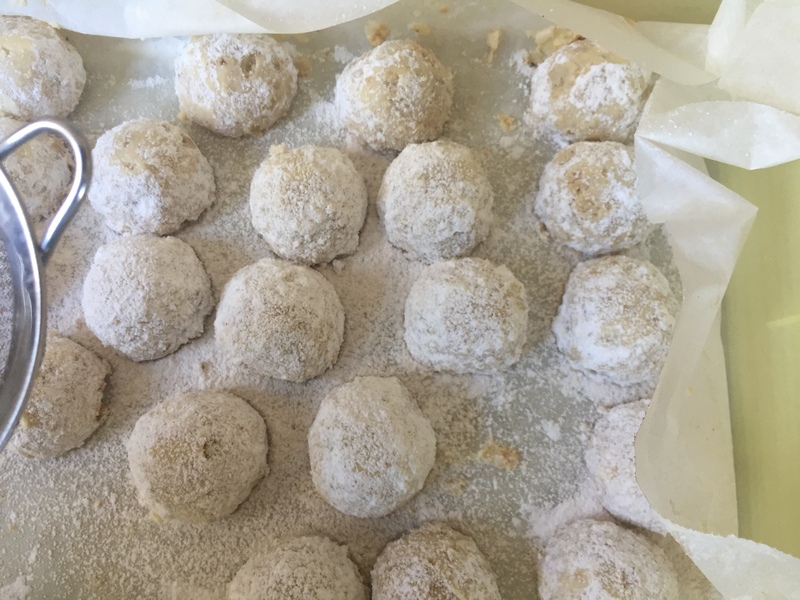 Leave for a couple of minutes to cool slightly, then put a layer of icing sugar in a shallow bowl and roll balls in sugar to coat thoroughly before cooling completely on a rack. You can dust with sugar again at this point, or just before serving. Avoid handling too much or you’ll get finger marks in the icing sugar. Store in an airtight container with paper between the layers. These little explosions really are delightful and remind me of another favourite of mine – almond crescents – which I believe are a Middle Eastern type of cookie. Thank you so much for the recipe! Great bit of R&D! I think those are the ones I find a bit variable – when they have ground nuts and other flavouring they can be lovely, but otherwise they just seem like very dry shortbread! I had to laugh at your description of exploding kourabiedes! Yes, they do explode. This time of year, it is inevitable to see people with powdered white sugar sprinkled on their clothes walking around Athens (and probably other parts of Greece as well). They also lack flavour (and are often made with margarine, not real butter). Love your version with pecans (a favourite nut of mine!) which is certainly a stronger flavoured nut than almonds. I’ll be making them on Monday. I don’t have Pecans at hand. Look forward to the update. Ta da! I made them. Just posting in a few minutes. I really enjoyed eating them, one day at a time, until they finally got finished and I was left licking my fingers and wishing i had some more. Thanks for sharing the recipe. It was well worth the trouble. yum these sound very delicious.